, or Paullo Giovio, an Italian historian, was a native of Como, and was born in 1483. Being early deprived of his father, he was educated under the care of his elder brother Benedict, who was also a historical writer. After having studied at Padua, Milan, and Pavia, he took the degree of M. D. and practised for some time; but an early propensity led him to the study and composition of history. Having completed a volume, he presented it to Leo X. at Rome, in 1516, who expressed a very high opinion of him, and gave him a pension and the rank of knighthood. 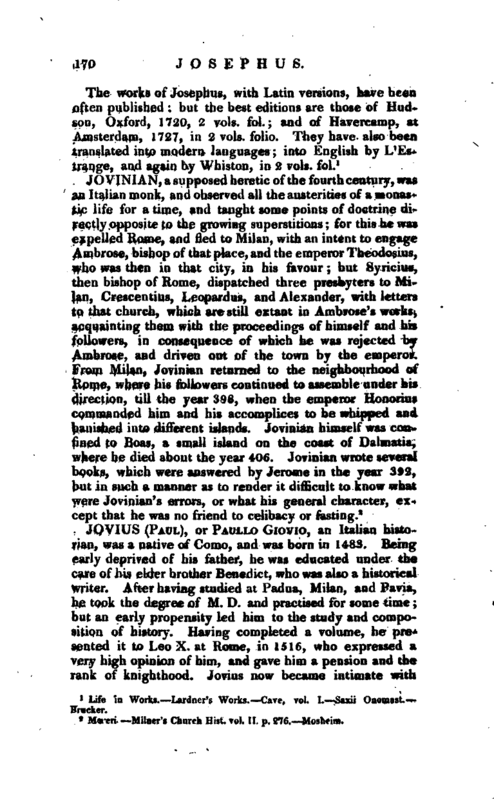 Jovius now became intimate with | the literati of Rome, and wrote several Latin poems, which appeared in the “Coryciana,” and other collections. After the death of Leo, Adrian VI. presented him to a canonry in the cathedral of Como, and Clement VII. appointed him one of his attendant courtiers, provided him with a handsome establishment in the Vatican, gave him the precentorship of Como, and lastly the bishopric of Nocera. During the sacking of the city of Rome, in 1527, Jovius was robbed of a considerable sum of money and of his manuscripts, but recovered the latter. Under the pontificate of Paul III. he wished to exchange his bishopric of Nocera for that of Como, and even carried his ambition to the place of cardinal, but was disappointed in both. 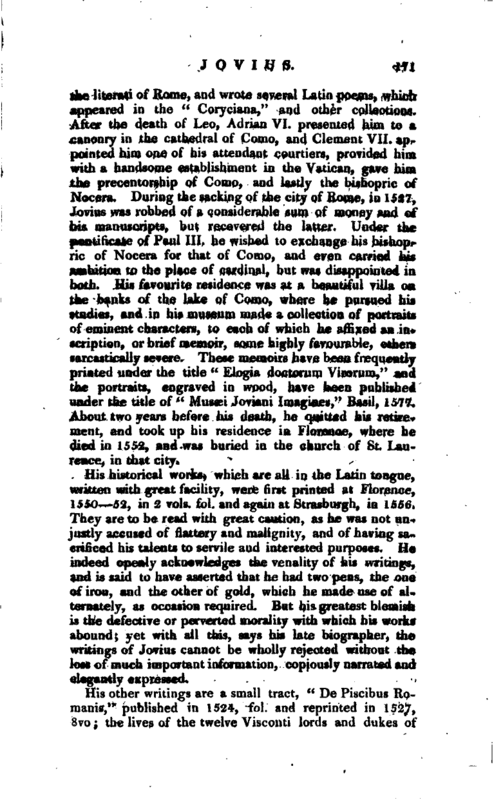 His favourite residence was at a beautiful villa on the banks of the lake of Como, where he pursued his studies, and in his museum made a collection of portraits of eminent characters, to each of which he affixed an inscription, or brief memoir, some highly favourable, others sarcastically severe. These memoirs have been frequently printed under the title “Elogia doctorum Virorum,” and the portraits, engraved in wood, have been published under the title of “Musaei Jovian i Imagines,” Basil, 1577. About two years before his death, he quitted his retirement, and took up his residence in Florence, where he died in 1552, and was buried in the church of St. Laurence, in that city. His historical works, which are all in the Latin tongue, written with great facility, were first printed at Florence, 1550 52, in 2 vols. fol. and again at Strasburgh, in 1556. They are to be read with great caution, as he was not unjustly accused of flattery and malignity, and of having sacrificed his talents to servile and interested purposes. He indeed openly acknowledges the venality of his writings, and is said to have asserted that he had two pens, the one of iron, and the other of gold, which he made use of alternately, as occasion required. 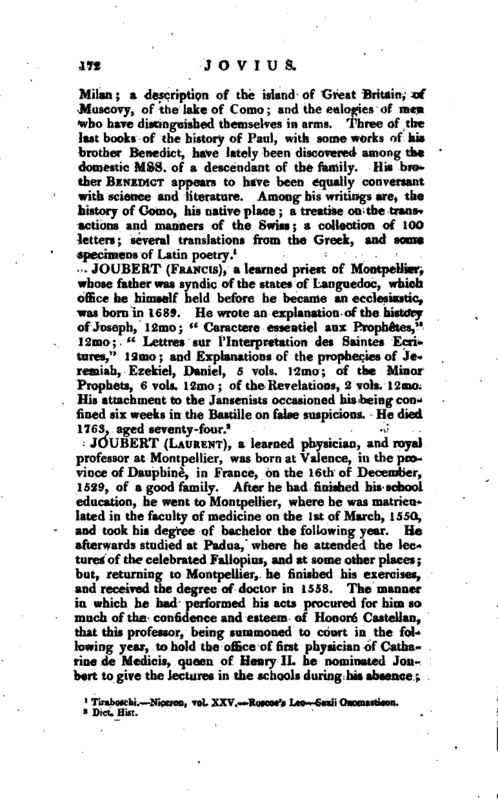 But his greatest blemish is the defective or perverted morality with which his works abound; yet with all this, says his late biographer, the writings of Jovius cannot be wholly rejected without the loss of much important information, copiously narrated and elegantly expressed. Tiraboschi. Xiceron, vol. XXV. Roscoe’s Leo Saxii Ononaasticon.